If the 2018 Geneva International Motor Show was defined by one thing, it’s the amount of concept cars that were on show. Getting a glimpse into the industry’s plans for the next few years in one day, every manufacturer seems to be firmly focused on the future of automotive manufacturing and innovation and as a result the concepts on show varied wildly. 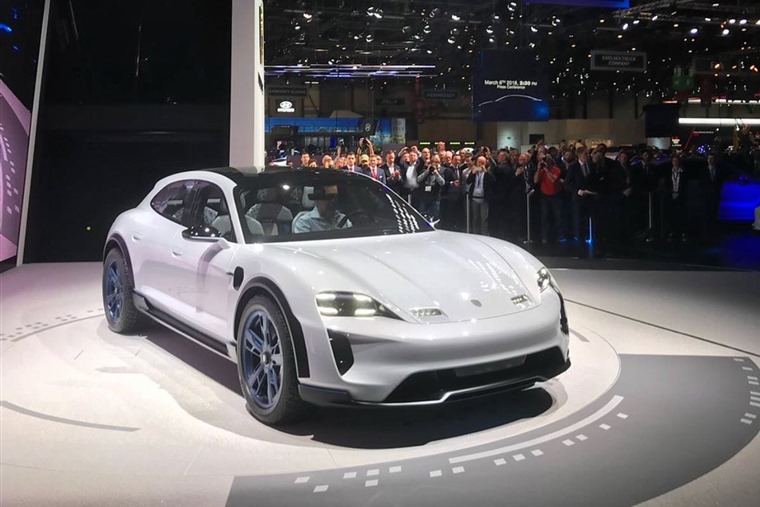 In the age of the spy shot, the shadowy teaser image and the online ‘leak’, the Porsche Mission E Cross Turismo was one of the few genuine surprises from the show and a real head-turner. While we’re still not-so-patiently waiting for the actual Mission E to show up, the Cross Turismo represents a crossover utility vehicle (CUV) spinoff which could actually make it into production. Claiming a sub-3.5-second 0-62mph time, acres of interior space and likely range of over 300 miles means it’ll be going up against the Tesla Model X as well as the all-new, albeit slightly slower and presumably less costly Jaguar I-Pace electric SUV. Styling cues are borrowed from the latest Panamera Sport Turismo – notably its shooting brake estate-like rear end and full-width tail light arrangement, while the four-door coupe measures 4.95 metres in length, a little shorter than the current Panamera. Sporty, compact and full of advanced technology, Vision X is Skoda’s concept for the urban crossover of the future and a hint of what it will offer when it arrives in 2019. Style-wise, it develops on some of Skoda’s current design cues, featuring the twin-headlight arrangement that’s become an integral feature of its current line-up. At 4,250mm long, it’ll be larger than the Seat Arona and VW T-Roc, with Skoda promising class-leading practicality. The Vision X features a 1.5-litre engine that’s specifically designed to run on CNG (compressed natural gas). It also gets a mild-hybrid 48V system which will boost power by up to 27bhp courtesy of two electric motors, and short journeys will be completed on electric power alone. The combination of the CNG mild-hybrid powertrain gives the Vision X a 0-62mpg time of 9.3 seconds and a top speed of 120mph. Emissions will be as low as 90g/km of CO2, and it’ll have a range of around 370 miles. 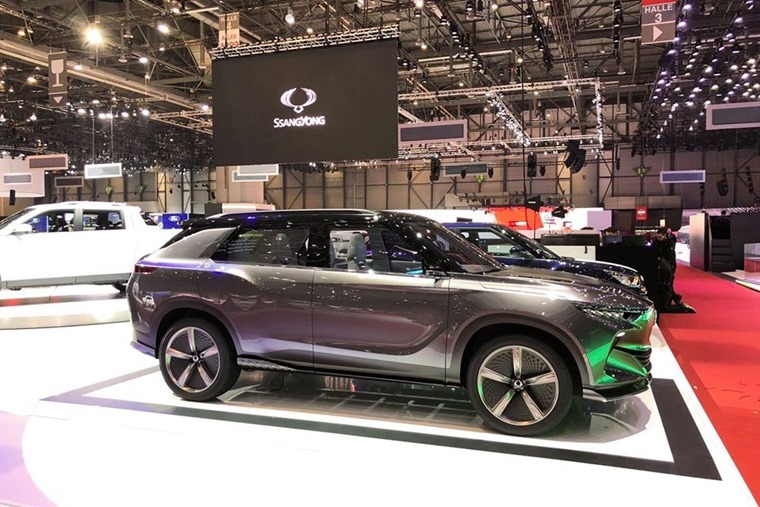 SsangYong confirmed that its first all-electric car will arrive before 2020, with the e-SIV – which stands for electronic smart interface vehicle – giving us a good idea of its future direction in terms of styling and autonomous driving tech. 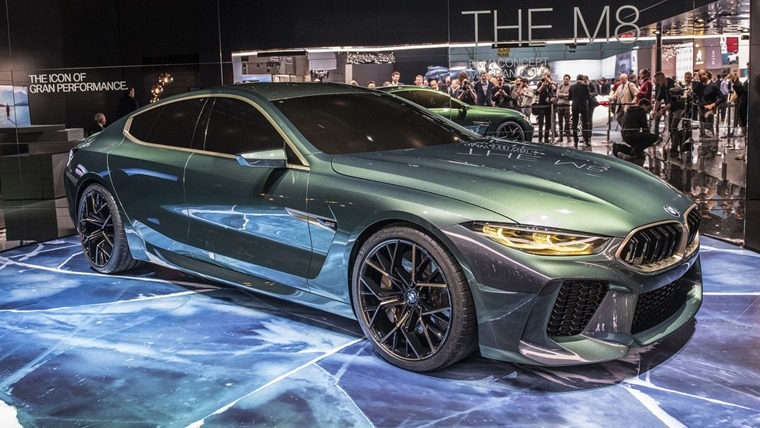 Taking pride of place on BMW’s stand at the show, the M8 Gran Coupe is a super fast, super luxury four-door variant of the upcoming 8 Series. Even better, it’s headed for production at some point in 2019. Technical details are thin on the ground, but a 3.0-litre six-cylinder will make up the entry-level option while a turbocharged 4.4-litre V8 is also likely. The range will be topped with a twin-turbo 6.6-litre 692bhp V12 that’s already available in the M760i. Following on from the likes of the previously announced I.D. hatch, I.D. Buzz and I.D. Crozz, Volkswagen is continuing to forge forward with yet another addition to the I.D. family of concepts, with the Vizzion getting its debut at Geneva. Capable of level 5 autonomous driving (fully self-driving), Volkswagen says this kind of car could be no more than a decade away, and has said we’ll see a production Vizzion by 2022 at the latest. Similar in size to the latest Audi A8 and BMW 7 Series, the concept takes the form of a swooping four-door coupe. It gets a snazzy set of rear-hinged ‘suicide’ passenger doors, although it’s unlikely that these will make it on to production models. The powertrain features two electric motors (75kW at the front and 150kW at the rear) together producing 225kW, or 306bhp. It can get from 0-62mph in 6.3 seconds but, due to its autonomous systems, the Vizzion’s top speed is limited to 11mph.